Declutter. Organize. Keep. Donate. Pitch. Keeping a house in order seems never-ending. Dusting. Laundry. Bathrooms. Sweeping. Mopping. Cleaning out refrigerator. What’s for dinner every night? What do I wear to work this week? What bills need to be paid? It’s a lot to keep a household running. Our spiritual life takes a lot of work as well. We should constantly be decluttering – sorting out what habits to keep, donate or pitch. Maybe you do a daily devotional reading each day. Someone else may have a deeper Bible study each day. Someone else may have a weekly study class. Maybe my prayer time is spent in a quiet place each day and someone else may choose to pray out loud in the car on the way to work. Maybe you don’t have a regular prayer or quiet time. I can’t tell you what’s good for your spiritual household and how you should decide what to keep, donate or pitch but if you ask God for direction He will be glad to help you sort things out. Just like stuff in our house, we tend to hold on to stuff in our lives that we really need to donate or pitch. Busyness can be a terrible habit. We get caught up in the martyrdom of “doing it all” and before we know it we have let the spiritual part of our life falter. Maybe there is something in that busyness bucket you can donate to someone else. Is God convicting you of a habit you know you need to let go of? Decide to pitch it today. Are there things you’re doing that you know God wants you to keep doing. You know – you get those excited, goose-bump feelings inside when you do them? Then that may be your “keeper”. I think today is the day to declutter the spiritual self. I’m going to start to really evaluate how I live my life. I’m going to spend some time in prayer and ask God what He wants me to keep, to give away and to pitch. I want my spiritual house in order so that I can spend my time doing and being what He wants from me. Are you with me? Lamentations 3:40 – Let us examine our ways and test them, and let us return to the Lord. **Day 3 and Day 4 February Make A Difference Month Challenge. I decided to get a day ahead for those who wish to “plan ahead” for the next act of kindness. If you are new to this blog, see my February Make A Difference Month blog for more details. A suggestion for day 3 – purchase something to give away. For example – if you are at a ballgame, buy an extra bag of popcorn and give to the person behind you in line. A suggestion for day 4 – Make a donation to your favorite charity. Let’s go make a difference by changing the world one act of kindness at a time! 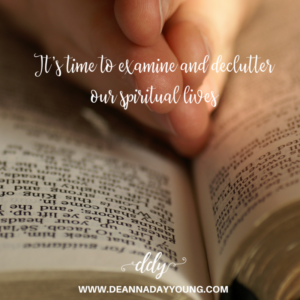 This entry was posted on February 3, 2018 with tags: #declutter, #makeadifference, organization, spiritual by Deanna Young.